This is an easy-to-make snack that’s just as easy on the pocket. Find Peppadew Jalapeno halves in most stores in the preserved food aisle. 2. Mix the cream cheese, cheddar cheese, parsley, black pepper and paprika together in a mixing bowl. 3. Arrange the Peppadew Jalapeno halves on a flat surface and fill with the cheese mixture. 4. 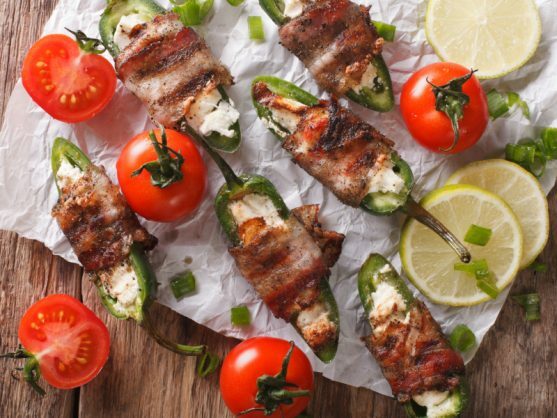 Wrap a slice of bacon around the middle of each jalapeno half and secure with a toothpick. 5. Place the Peppadew Jalapeno halves in a single layer on a baking tray lined with foil. 6. Bake for 10 to 15 minutes, or until the bacon is cooked and crispy.